President Emmanuel Macron’s call for a “renewal of Europe” made a splash in the media but got a muted reaction from other national leaders. Henrik Uterwedde explains whether Macron’s European political offensive is in fact a tactical move, aimed to resonate within France as well as beyond its borders. Henrik Uterwedde is a member of the expert network of the Bertelsmann Stiftung’s Sustainable Governance Indicators (SGI) project and is a co-author of the France Country Report 2018. In France, European elections have always been a testing ground for national voter sentiment and are frequently seized on as a chance to punish the incumbent government and the president. This year’s European Parliament election on 26 May comes in the wake of an extended government crisis triggered by the yellow-vest movement back in November 2018. President Emmanuel Macron has seen his popularity slide as a result. To the cheers of large sections of the electorate, yellow-vest protesters articulated their collective frustration at the plight of the middle classes in rural France. Above all they also loudly, and not without violent excesses, pointed a finger at the arrogance of the president and the Parisian political class. With his back to the wall, the president had difficulty getting back his political stride. Since the beginning of the year, however, he seems to have regained some composure. He was able to take the wind out of the yellow vests’ sails with a purchasing-power program costing ten billion euros and a broad-based “major national debate” comprising over 10,000 decentralized debates throughout the country. The debate met with an overwhelming response from voters and has sparked 1.4 million comments on the project’s Internet platform. These steps have significantly increased his approval ratings in the polls, at least for the time being. This background already points to the intermeshing of the domestic and European political debate this year. Nothing short of Macron’s courageous reform course, which he launched in 2017, and thus the country’s ability to change, is being put to the test. The president is faced with a double challenge: On the one hand, following the highly successful national debate, it is time to send a strong political signal. Macron must now prove that his response was no PR gag, no diversionary maneuver, and show that he takes voter criticism seriously, while also remaining true to his planned course of reform. He has pledged to seriously consider points raised during the debate and to adopt appropriate policy measures. That leaves him open to the very real danger of disappointing people, amid high expectations for tax cuts, increased purchasing power, social justice and more direct democracy. On the other hand, Macron, who, more than anyone else, has staked his political position on close ties to a courageous and ambitious European project, must also take the baton once again on this issue. His message to the electorate in 2017 combined a resounding yes to France’s European integration with a call for far-reaching reforms of the EU. But his demands triggered polite interest but little enthusiasm in Brussels and other partner countries. Germany, which Macron had banked on for support, initially failed to respond amid its delayed formation of a new government. When it did finally react, it was nothing but cautious. Macron has chosen to adopt his own specific outreach tactic: He made a personal plea to European citizens to “renew Europe”, which was broadcast simultaneously on 5 March by the major media of all 28-member states. 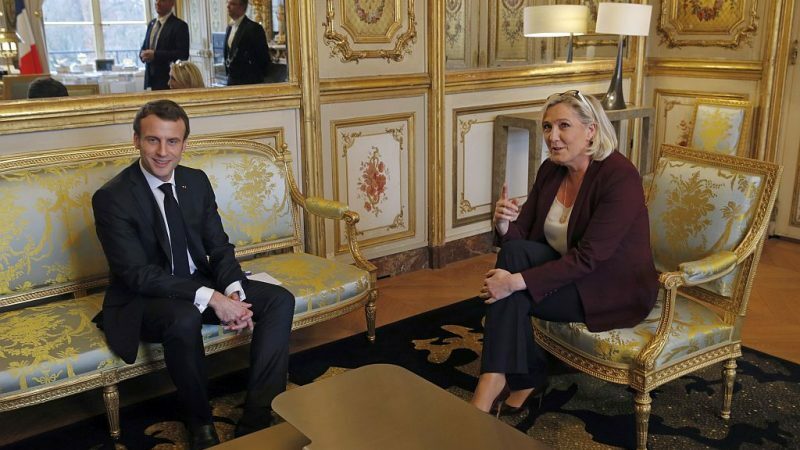 With this offensive, Macron has effectively ushered in the European election campaign, although it is likely to be late in the day and rather short lived, since France’s national debate is still going strong and will continue into April, overshadowing other topics. The president has two looming concerns: Firstly, he must avoid defeat for his party, La République en Marche (LREM), if he is not to weaken his domestic position and, in one fell swoop, his ambitious course of reform, which he has so far clung to despite all the adversity. Alongside this domestic political goal, Macron seeks to strengthen his influence in the EU. His LREM party has joined forces with the parties of the liberal grouping in the European Parliament. He hopes that his European course will also attract enough voters in other countries and that the liberals will remain strong enough after the European Parliament elections to break the Christian Democrats and Social Democrats’ long-standing cartel and to exert decisive influence on the election of the European Commission’s President. Macron has learnt from the yellow-vest protests, refocusing his governing style on the grassroots, and meanwhile, he has also altered his European policy. His original blanket statements about “progressive Europeans” confronting all “nationalist” forces have given way to a more cautious rhetoric. He touts a “Europe that protects its values and its borders” and addresses voters’ fears and misgivings by backing the values of freedom, protection and progress. He also talks of sovereignty and protection, two goals expounded by right-wing populists, but which Macron defines as a shared European task rather than a national one. But how will the pending European ballot affect the political landscape in France, which has been so rattled by its own presidential election? The rather unfamiliar electoral method for France – complete with its national lists, proportional representation and a five percent threshold – encourages fragmentation, but it also favors Macron’s LREM party, which is yet to establish itself locally. And the traditional left wing or conservative parties are in no position to make life difficult for the ruling party. Both have been unable to shake off their crushing defeat in 2017 and have failed to relaunch themselves, with the Left, in particular, looking hopelessly fragmented. The main threat to Macron, comes from the extremes of the left and the right, in particular the right-wing extremists. The latest polls predict a neck-and-neck race between LREM and the right-wing extremist national racist movement of Marine Le Pen. Both stand at 20 to 24%, well ahead of the conservatives who only garner around 13%. The Greens – traditionally left wing in France – only reach single-digit percentages, and the Socialists trail them. This also applies to left-wing populist Jean-Luc Mélenchon, who in 2017 was a serious contender in the presidential election and whose approval ratings have fallen sharply, despite his ambitions to lead the opposition against Macron. What is clear, however, is that the focus of the European elections will be less about the political ideas of individual parties and more a test of the president, his policies and his leadership style. In view of the considerable centralization of power in France, the outcome of the elections will determine whether the country will be able to transform itself internally and play a decisive role in future EU decisions.